When my herbs come, they come in full force! It's sometimes hard to keep up with them. Do you have this same problem? I always tell myself, this isn't a problem ... it's a blessing! And with that, the herbs keep coming! 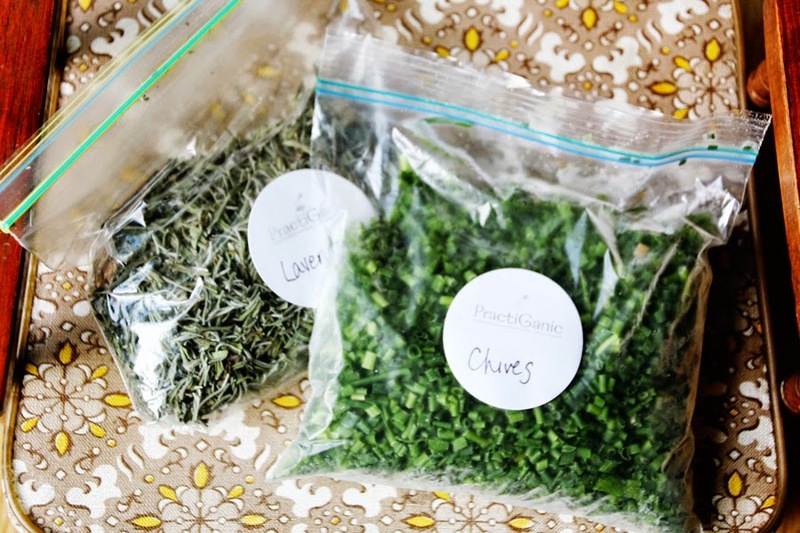 Once I learned that I didn't have to keep clipping and giving away (even thought I still give a lot away), I learned how to utilize my herbs more so I could have them for the entire year. Herbs began to be a much more fun project instead of a stressful job. So now, the main questions was ... should I freeze them or dry them? Well, I do both. The herbs that I use more for culinary purposes, I feel are best when they are frozen and the herbs for aromatics are best dried. Of course, there are always exceptions! Basil: Currently, I have three basil plants because we love a lot of pesto in this family! You can imagine the amount of basil I have ready to go at all times so I make a of bunch of Basil Pesto every week. 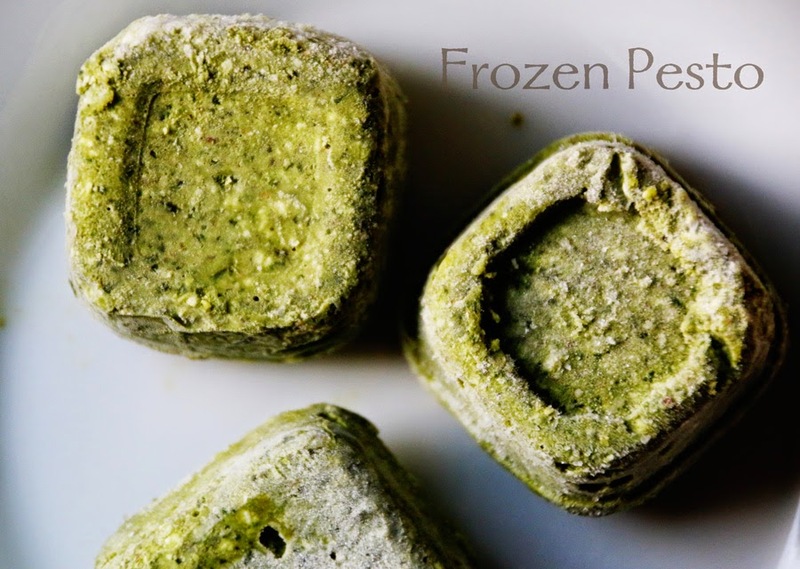 I then freeze it in ice cube trays and pop them out when they're frozen, storing them in freezer bags. Fresh pesto all year long! Chives: I usually try to cut my plants down as they are blooming and you can see when the chive flowers are starting to die off. Harvest everything! I chop them in different sizes ... some inch long pieces and some chopped finely because I use different sizes for different recipes. 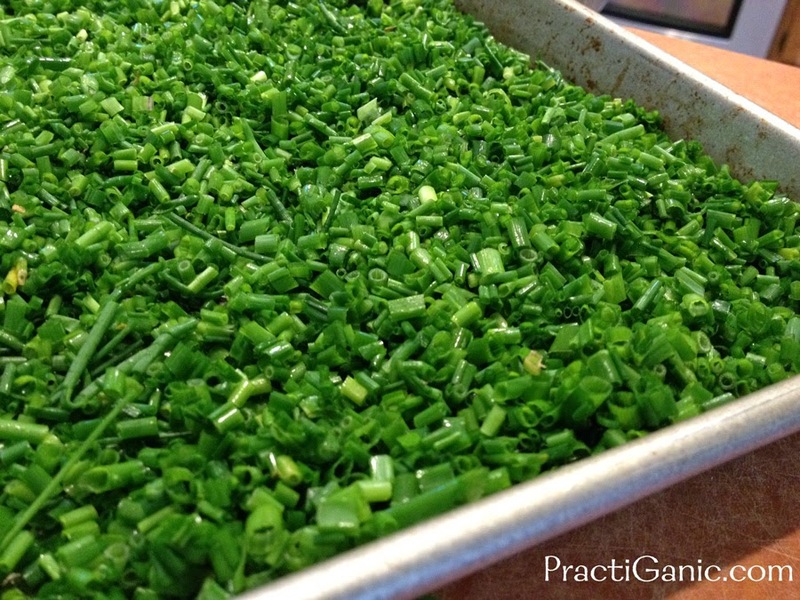 Lay them out on sheet trays and place in the freezer. This way, once you bag them they won't be one large frozen clump! I will bag the sizes separately. 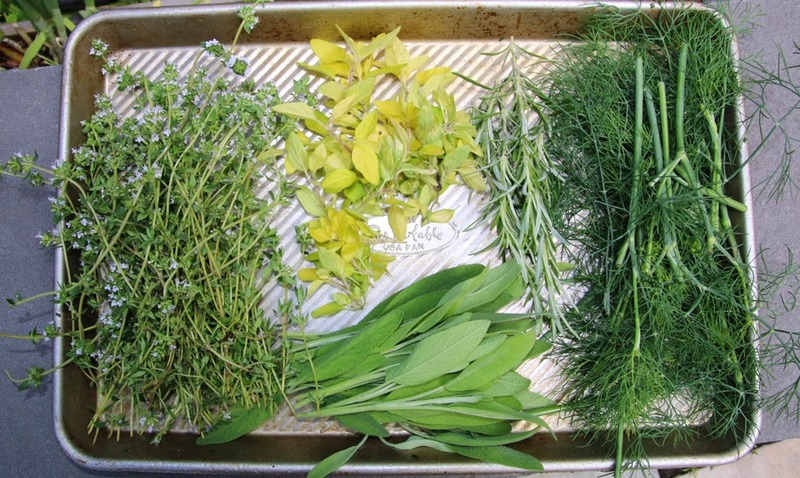 Dill, Rosemary, Sage and Thyme are herbs that I have also begun to freeze. I find that they stay much more fragrant in the winter months. Pick them from the garden, wash in cold water, then dry them ... stems and all. Next, put them each in their own freezer bags and freeze for about a week or so. When you pull them out, use your rolling pin and gently roll over your herbs. The leaves will pull away from the stems easily. If some don't, just put them back in the freezer a little longer. 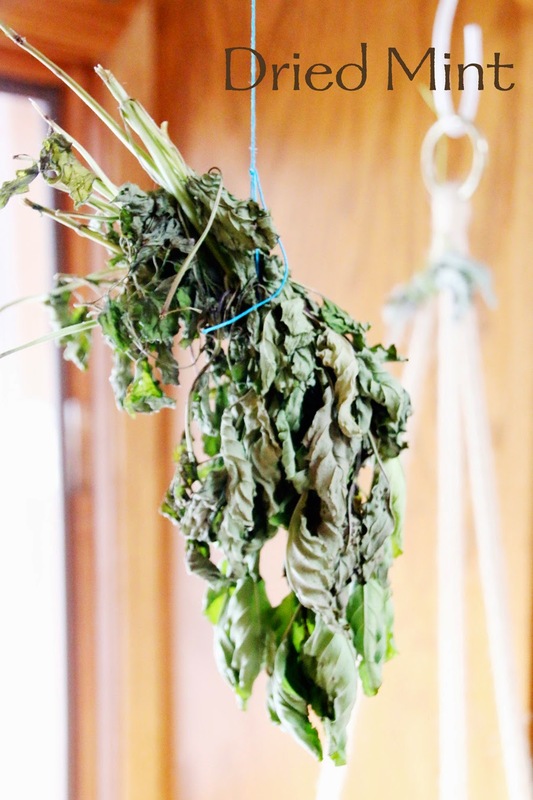 Discard your stems and put the leaves back into your air-tight freezer bags or mason jars. Use when ready and feel like the garden is growing all year long! *Because dill leaves are more fragile, I will leave those on the stems. Simply wrap your herbs in bunches and hag from a window or wherever you have room. Depending on the size of your bunch will determine how long it needs to hang. Once the leaves are brittle to the touch, place them in a bag and crush them with a rolling pin. Store them in containers or bags. Lavender: I use for both tea and baking. Mint: I'm not a huge mint fan in my food, but I like the smell. I sprinkle dried mint on the carpeting and vacuum it up for a fresh mint smell in the house. Oregano: There is nothing better then fresh oregano from the garden. I swear the dried stuff from the store is a totally different herb! I tried freezing it but the leaves were too fragile and they didn't freeze well. Drying it is the only option and it still tastes great. Because oregano is hard to tie-up, I will leave it on a paper towel lined sheet tray in a warm spot of the house until it is dried. Once dried, I will crush and bag. 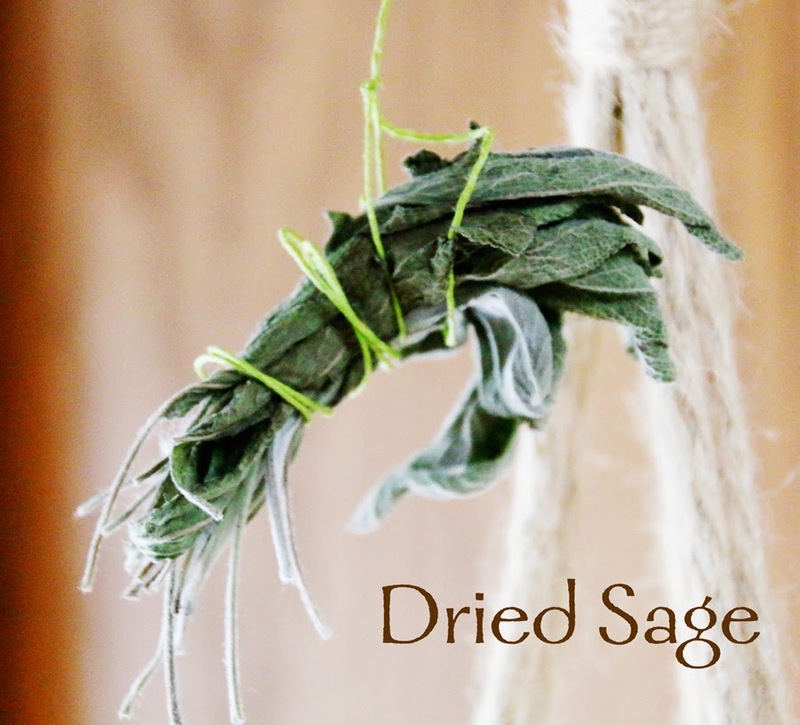 Sage: Even though I freeze sage, I still like to dry some. Some I will crush for cooking and other bunches I will leave whole ... we like to burn them around the campfire.